Boy it has been hot this week. Like a steaming mid-August hot accompanied by all the humidity and stickiness one could expect in Minnesota with the only difference that was May. I keep reminding myself that we got 16 inches a snow a month ago so I should not be complaining but to be honest, it was damn hot. This Minnesota weather is almost like a temperamental teenager, one day is sweet and lovely and the next day they hate you and the rest of the world. But what is a girl to do. Put a dress on, sunscreen and head out to the farmers market hoping to steal the fast-coming-and-dissapering spring greens. My most vivid memories of spring are back from the days when I was a temperamental and hijacked by confusing emotions teenager myself. Early springtime my dad, my grandma and I would go to our house in the mountains to plant the veggies for the season. Bringing a little of food with us we would walk the area around the house and the hills collecting wild edible greens – dandelion, spinach, spring garlic and nettle. In a typical teenage fashion, I was so skeptical about all this foraged greenery and I didn’t think it would taste much like anything. But then my grandma would whip them all together in a lovely and simple soup or a risotto topped with plain yogurt and dill instead of cheese and I would lick my fingers off and finish up all of the green goodness on my plate. I couldn’t really figure out what was it about it. Was it the nettle, or the young wild garlic, or the other greens, or the cool mountain air that made every scent and experience intensified by a hundred times. The only thing I know is that I kept eating and immersing myself in these wild and wonderful flavors. It was almost like the young green grass got married to the rain and the wet ground and the fresh air and they created this beautiful thing together that I got to experience and enjoy. So as every winter ends and spring begins I dream of these flavors and hold the wish that hopefully this spring will be long and cool and will last for a couple of months only so I could enjoy, just for a little longer, these wonderful flavors. 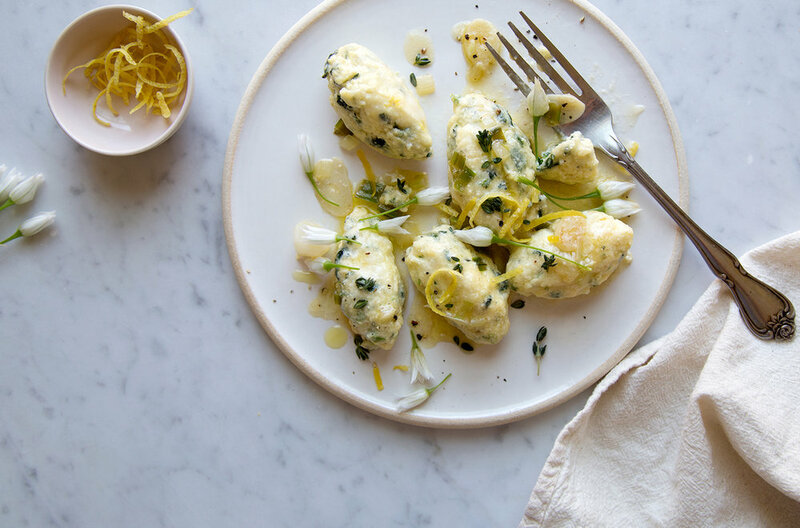 These pillowy and soft dumplings have a hint of nettle that marries really well with the young spring onion and the garlic/butter sauce. 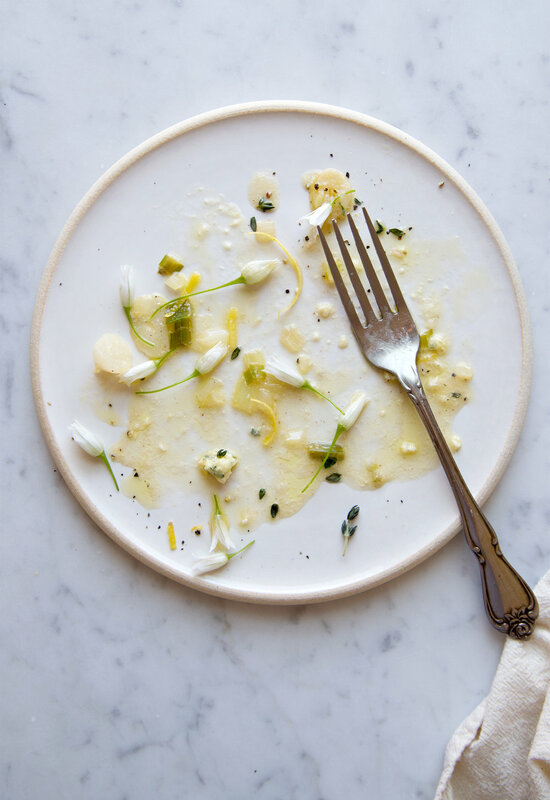 The onion flowers have a wonderful mild oniony flavor and bring the whole dish together, plus they make the plate really pretty! Bring 6 cups of salted water to a boil. Turn the heat off, add the nettle (handle with gloves so it doesn’t sting you) and let it sit for 5 minutes. Drain the nettle in a colander and let it sit for a few minutes to cool down slightly. Finely chop the nettle and add to a large mixing bowl together with all the dumpling ingredients. Mix well, taste and add more seasoning if needed. 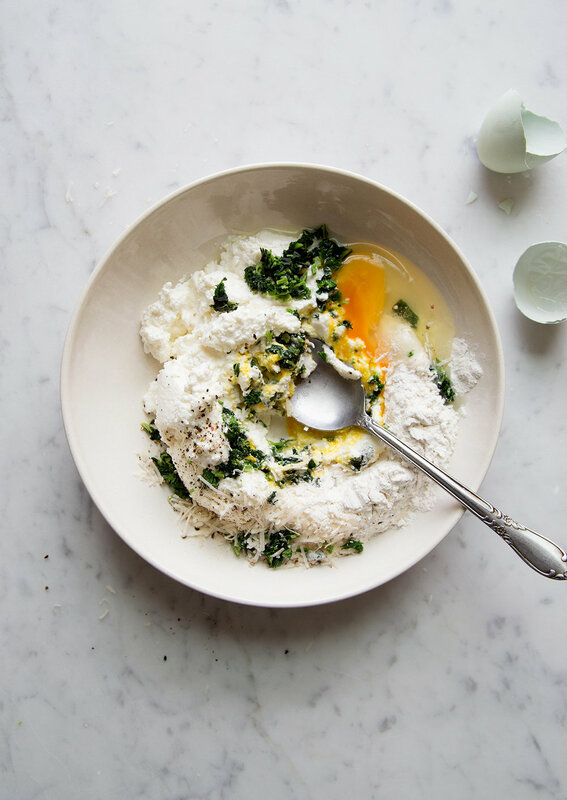 Place the dusting flour in a bowl. Dust a large baking sheet generously. 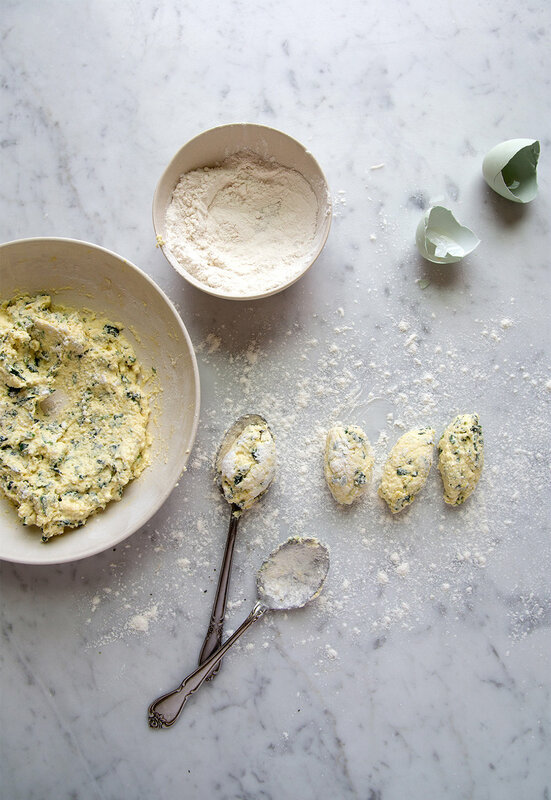 Using two spoons, dip them in the bowl with flour then with one of them scoop a heaping amount of the dumplings mixture and with the help of the other spoon slide the dumpling out on the dusted baking sheet. Repeat until no mixture is left. Refrigerate the dumplings for 30 minutes so they harden and are easier to handle. Bring a large pot of salted water to a boil. Add the dumplings in batches (about 2 bathes in my case) and gently cook for 5 minutes. Transfer with a slotted spoon to a plate. Meanwhile, in a large non-stick pan add the butter, the garlic, the onions and a pinch of salt, sauté until the onion is soft and the garlic is slightly golden but not burned. Add the wine and cook for 10 more seconds. If you think that your pan will not fit all the dumplings, spoon half of the sauce in a bowl and reserve half of the dumplings. Add the dumplings to the pan and shake the pan slightly to cover the dumplings with the sauce but do not move them around with a spoon since they might fall apart. If the dumplings look dry, add a bit of the dumplings water. Cook for a minute and transfer to a serving plate. Repeat the process with the other half of the dumplings and sauce if you have reserved them. Top dumplings with the lemon rind, thyme, the reserved onion flowers (if using) and sprinkle with black pepper. Serve immediately.